Muara is the main port of Brunei and here you'll find one of Brunei's five beaches. Muara also serves as the gateway to the century-old Kampong Ayer or "Water Village", that is really a series of small communities linked by 29,140 meters of foot-bridges. Brunei is so unique. Clean, wealthy and mellow. 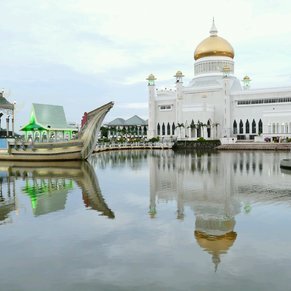 Brunei is an unusual place, we did a city tour, water village visit, and a wildlife river cruise. The tour would have been more interesting if instead of visiting a water village for the third day in a row. the river cruise had gone another 5 minutes to see the largest palace in the world which is undoubtedly the place to not miss in Brunei. There are currently 0 discussions about Muara, Brunei.